Of course, that's the national average, so locations not so over-valued can expect to not fall as much as the cities that are over-valued. Vancouver and Toronto, being the two biggest and most heated markets are expected to lead the way when it comes to price declines. Victoria, given it's flat values for the past few years, can expect to see pain, but likely not as much as it's big city cousin to the east. For the purposes of this exercise, let's say it falls the maximum predicted average 15%. Last year's annual average SFH price was $613K and three more digits of ish. $116K creates enough ish to make the buy now vs wait decision a bit wait heavy no? 20 unit sales per day... not much else to say. Are people still taking the real estate course thinking a realtor license is a fast track to riches? Old news by now thanks to the interwebs, but the 30 year amortization is expected to end, when we're not sure yet, but the announcement will come tomorrow. Is this significant? Only time will tell, but I'm guessing it'll be slight, much like previous changes to amortization amounts had little impact on the market. More concerning should be the signal this sends to the buying public. The Bank of Canada is warning on debt levels to the point of being ignored and so is the finance department. Canadians have shown a remarkable ability to ignore economic sense and continue to spend their way through the most troubling financial times we've seen since the 1930s. The mirror market of last year continues. Listings sped up a bit last week so we're now running the same rate as a year ago. This kind of market produced gentle declines in the past 2 years (~2% a year) so it is still relatively balanced. OSFI restrictions will give it a bit of a nudge, and certainly won't be good news for anyone in the reno industry, as HELOC room will be reduced considerably. The Bank of Canada is again warning about the eurozone crisis and the shockwave that will be felt when should any of the those uber-large debt bubbles pop. Is it time to batten down your household hatches? Or should we start a letter writing campaign to the VREB and VCoC to get them to run those "we're insulated" reassurance ads again? Great discussion on the last post! Thanks everyone for contributing so actively and civilly to the discussion. I follow a lot of blogs but almost all of them are either very inactive with few comments, or busy but lots of noise and fighting in the comments. Although ostensibly a bear blog, I think there is good information here for everyone interested in real estate. Again the numbers are close to last year's, with listings lagging a tad. Marko reports the SFH average at $555k and the condo average at $345k. The SFH average is very low, but that can change quickly with a couple high end sales. In the last post, in an effort to understand how prices could look like a bubble going up but then flatten out, I started to look at monthly payments as a first indication of affordability. Sure enough, when looking at monthly payments we see a symmetrical steep decline after a steep rise. 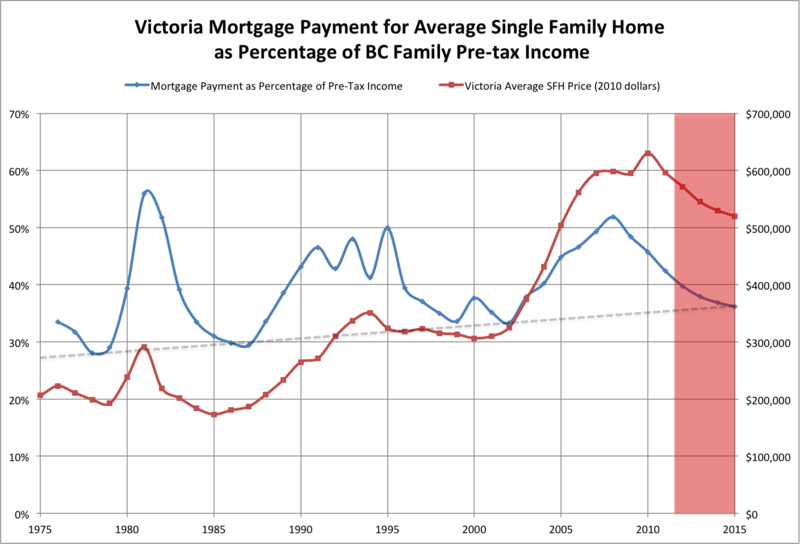 Of course payments are only half the story when looking at affordability. 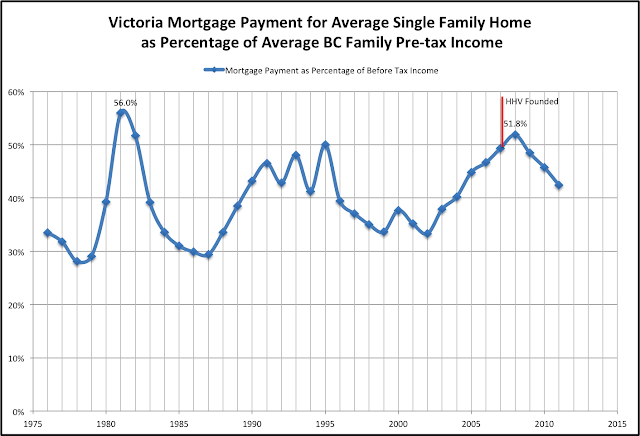 If incomes have risen along with mortgage payments, then we don't necessarily have a problem. So let's dig a little deeper. First, the income figures. 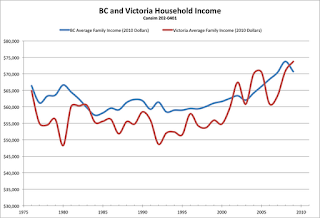 I'm using average total family income for all family types (CANSIM 202-0401) which goes from 1976 to 2009. 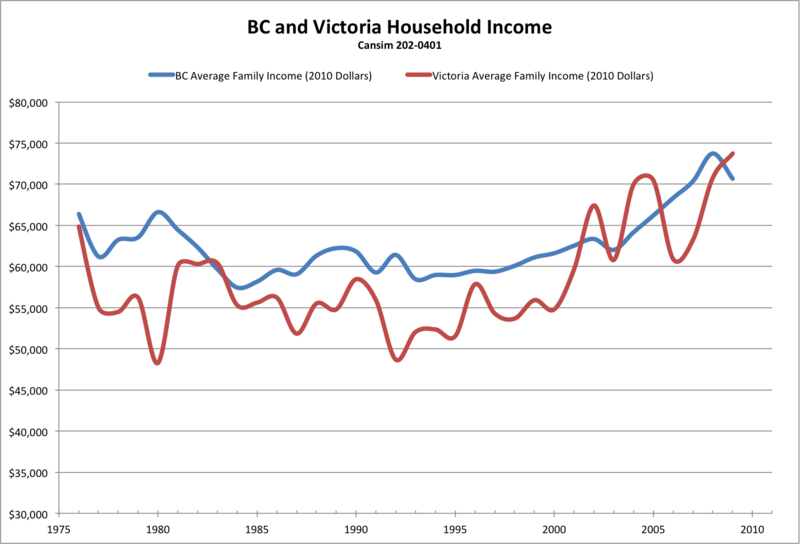 There is data for only Victoria, but I'm using the BC numbers because the Victoria figures are often based on less than 200 responses, and this makes the average too volatile year to year. They're not wildly different in any case. For the years 2010 and 2011, I'm using the year over year change in average weekly earnings (CANSIM 281-0028) to estimate the growth in income, which has basically matched inflation. Average mortgage lending rates are from the Bank of Canada. Last time I assumed a constant 25 year amortization, but I wanted to take into account that lending restrictions have been eased over the years, and people are lowering their monthly payments by taking longer amortizations. The best data on this comes from CAAMP, who list the average original amortization period by year of purchase in their Fall 2011 report. Data is only grouped into amortization ranges, but based on that I estimate that average amortizations increased about 12% due to CMHC loosening their restrictions. I can't find any data on average down payments, so I've assumed a fixed 20% (which is very generous, considering Genworth estimates only half that for their mortgage portfolio). 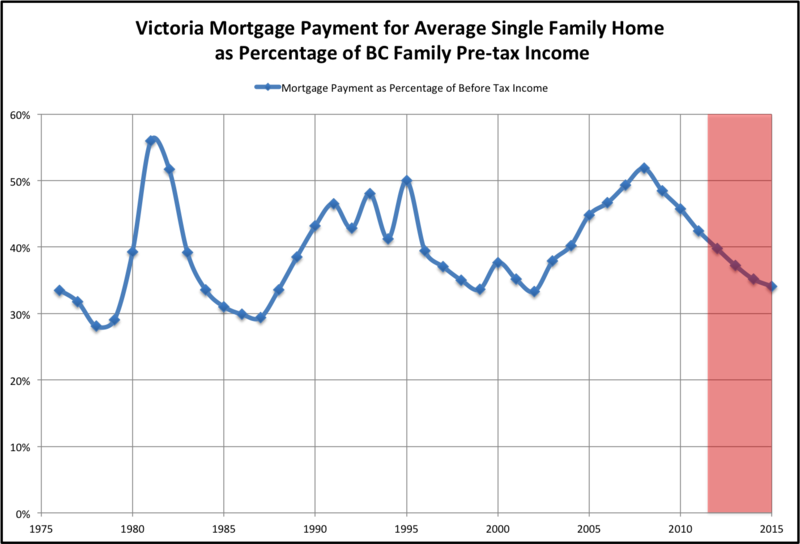 With those assumptions, let's take a look at affordability in terms of the percentage of pre-tax income an average BC family requires to purchase an average Victoria single family home. Overall, it really doesn't look too concerning. By crashing interest rates, the government has improved affordability quite dramatically from the high of 2008. The levels don't really seem to be out of line with the levels of the last 35 years. Based on that, what could happen going forward? Let's assume that incomes will continue to match inflation, and interest rates will stay at their current levels. Possible affordability under scenario 3. Prices start increasing again. Interest rates are low, it's a good time to buy, affordability figures aren't that scary, the tech sector is booming, etc. While anything is possible, that would make this correction quite unusual by being both shorter and shallower than those that have come before. Prices remain flat like a halibut. I can certainly see the logic behind this argument given the current affordability levels, but I think it would again be a break from previous corrections. Why would we stay at this poorer level of affordability instead of continuing to decline? Affordability corrects back to the levels of the late 90s (payments at around ~33% of income). The "back to where we started" option. Possible, but I like the next option better. Affordability corrects but not quite to the levels of the previous low. There are many solid arguments to be made that as a city grows and densifies, single family detached homes will become relatively more and more expensive compared to local incomes as more people make do with townhouses and condos. A rough look at the levels of the last 3 lows would indicate that the next one might occur at 36%. I look at this as a best realistic case for house prices. We haven't taken into account that down payments have shrunk substantially, and if interest rates go up all bets are off. However in the absence of an external trigger, I think this scenario is more or less defensible based on our history. Crash. Many things have the potential to trigger a larger correction going forward. Interest rates, CMHC restrictions, implosion of any number of large world economies, megaquake, etc. This is always a risk, and one could argue that the possible triggers are piling up every day. Overall it would mean a peak to trough correction of about 15% in real prices. This is more or less the flat landing scenario. 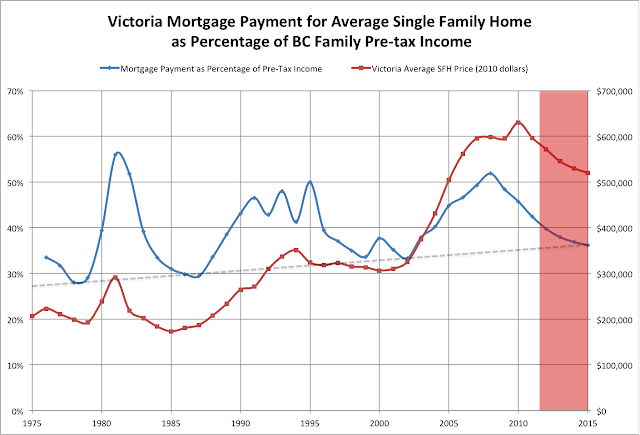 As soon as interest rates rise even moderately, the picture changes (a 1.5% rise in rates by 2015 in the above graph would knock another $80k off prices).